I kept hearing about this book. The good and the bad. It was everywhere. I needed to read it. I was totally engrossed from the first page. 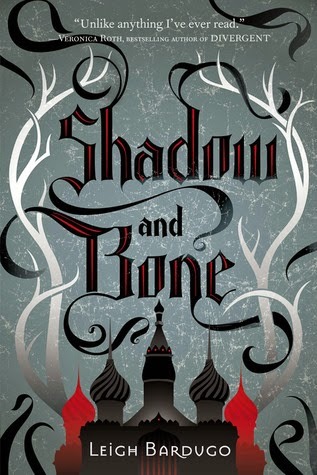 I loved Mal and Alina and the entire atmosphere of the book, including the writing. I've heard a lot of complaints about the use of a Russian theme. As someone who has spent years studying Russian history and the Russian language I can tell you that I was not bothered by it. It's a beautifully crafted YA fantasy read. Before I forget can I just mentioned that I love this cover. It's sooo cool. I also loved the typeface and all the details on the pages as I read. For me little visuals like this are great embellishments to books. Yes, this is a YA fantasy romance and YES, this is my favourite type of story. However, there are millions out there and I have read some that I didn't enjoy or finish. This takes my love of YA fantasy/romance and combines it with a rich folklore and storytelling . The story is about Alina and Mal who were orphaned as young children and end up growing up together at the estate of a kind duke. Both of them end up being tested by the Grisha, who are a powerful group of magicians, but neither of them show an aptitude as a Grisha. Alina ends up studying to be an army cartographer and Mal becomes a military tracker. Both Alina and Mal are accomplished in their studies and as both are serving the military it allows them to continue to be together. Alina who is described as very bright but homely has to watch as her best friend Mal, who is of course dashingly handsome be adored by every single girl around. However, over time they realize that they are best friends who also have romantic feelings for each other. It's a slow burning love that comes from friendship. There are a lot of twists and turns in the book and during an attack it becomes known that Alina actually has powers she didn't know she had. This leads her to become a very important person in the kingdom and her life is in constant danger. She can save the kingdom but only if she is kept save from her enemies, which include those in the kingdom and those outside of it. This is a great first book (and lucky you can catch up with the other two now). I really enjoyed this book. I was in the mood for fantasy and I love Russian elements to a story. All together it was a great combination for me and I can't wait to see where the story goes from here.